Phenazine-1-carboxamide (PCN), a phenazine derivative, is strongly antagonistic to fungal phytopathogens. The high PCN biocontrol activity fascinated researcher’s attention in isolating and identifying novel bacterial strains combined with engineering strategies to target PCN as a lead molecule. The chemical route for phenazines biosynthesis employs toxic chemicals and display low productivities, require harsh reaction conditions, and generate toxic by-products. Phenazine biosynthesis using some natural phenazine-producers represent remarkable advantages of non-toxicity and possibly high yield in environmentally-friendlier settings. A biocontrol bacterium with antagonistic activity towards fungal plant pathogens, designated as strain HT66, was isolated from the rice rhizosphere. The strain HT66 was identified as Pseudomonas chlororaphis based on the colony morphology, gas chromatography of cellular fatty acids and 16S rDNA sequence analysis. The secondary metabolite produced by HT66 strain was purified and identified as PCN through mass spectrometry, and 1H, 13C nuclear magnetic resonance spectrum. The yield of PCN by wild-type strain HT66 was 424.87 mg/L at 24 h. The inactivation of psrA and rpeA increased PCN production by 1.66- and 3.06-fold, respectively, which suggests that psrA and rpeA are PCN biosynthesis repressors. qRT-PCR analysis showed that the expression of phzI, phzR, and phzE was markedly increased in the psrA and rpeA double mutant than in psrA or rpeA mutant. However, the transcription level of rpeA and rpeB in strain HT66ΔpsrA increased by 3.52- and 11.58-folds, respectively. The reduced psrA expression in HT66ΔrpeA strain evidenced a complex regulation mechanism for PCN production in HT66. In conclusion, the results evidence that P. chlororaphis HT66 could be modified as a potential cell factory for industrial-scale biosynthesis of PCN and other phenazine derivatives by metabolic engineering strategies. During the past couple of decades, plant growth-promoting rhizobacteria (PGPR) have attracted a great deal of researcher’s attention in the field of agriculture. Majority of these bacteria function as biological control agents in various plant-pathogen systems and promote plant growth by protecting them from various soil-borne pathogens [1, 2]. The secondary metabolites produced by PGPR species, such as phenazine derivatives, play a noteworthy role in interactions between these strains and other organisms [3–5]. Phenazines are nitrogen-containing heterocyclic pigments that exhibit broad-spectrum antifungal, antibacterial, anti-tumor, antimalarial, and antiparasitic potentialities in various niches [6–9]. For example, phenazine-1-carboxylic acid (PCA) greatly reduces the risk of a severe wheat root disease caused by Gaeumannomyces graminis var. tritici [10, 11]. Phenazine-1-carboxamide (PCN) possesses notable antifungal activity against Fusarium oxysporum f. sp. radicis-lycopersici [12, 13]. In addition, phenazine derivatives show great potential for use as electron acceptors and donors , components of microbial fuel cells (MFC) , and environmental sensors and biosensors [16, 17]. Most phenazine producing Pseudomonas strains are isolated from soil environment [6, 18]. Pseudomonas can synthesize several phenazine compounds, such as PCA produced by P. aeruginosa , and 2-hydroxy-phenazine (2-OH-PHZ) produced by P. chlororaphis . The hypothesis that PCA is transformed further into PCN by the glutamine amidotransferase enzyme PhzH, was first described in P. chlororaphis PCL1391 . The high biocontrol activity of PCN against many fungal plant pathogens fascinated researcher’s interest in isolating and identifying novel bacterial strains together with engineering strategies to target PCN as a lead molecule [3, 22]. Pseudomonas species utilize combinations of conserved regulatory systems for phenazine biosynthesis in response to diverse environmental signals. These regulatory elements include the gacS/gacA and rpeA/rpeB two-component signal transduction, the tetR homolog psrA, pip (phenazine inducing protein), alternative sigma factor rpoS, and the quorum sensing system phzI/phzR . GacS and gacA function as master regulators in Pseudomonas species . The membrane-bound histidine kinase, GacS activates the cytoplasmic response regulator by phosphorylation at the N-terminal domain of GacA responding to environmental signals. As a global factor, rpoS controls a series of quorum-sensitive gene expression at the onset of stationary phase, depending on the growth conditions and species . psrA, which responses to cell density and controls rpoS gene promoter , represses or stimulates N-acyl homoserine lactones (AHL) synthesis as well as PCN production depending on the growth medium in P. chlororaphis PCL1391 [27, 28]. Situated at downstream of psrA/rpoS and upstream of phzI/phzR, pip is essential for phenazine production and shows similarity to members of the tetR/acrR family of transcriptional regulators . Autoinducers produced by phzI are supposed to bind to PhzR. The complex subsequently switches on expression of the phz operon which is involved in phenazines biosynthesis. Thus, the phenazine regulatory genes ultimately act on the quorum-sensing system . rpeA/rpeB is another regulatory element that independently regulates phenazine biosynthesis using pip as a common regulatory intermediate with rpoS . Generally, synthesis of the core phenazine PCA is encoded by a conserved cluster of several genes in phenazine-producing bacteria . However, few studies have focused on the effects of rpeA in regulating PCN production and the connection between rpeA and psrA in phenazine regulatory network [28, 31]. The present study reports the isolation of a novel Pseudomonas strain, designated as HT66; from the rhizosphere soil of rice. An antimicrobial compound was separated from organic fraction and purified by preparative high-performance liquid chromatography (HPLC). The compound was identified as PCN with the highest production of 424.87 mg/L by the wild-type strain. The effects of the deletion of psrA and rpeA on phenazine biosynthesis in P. chlororaphis HT66 were investigated by constructing single mutants (HT66ΔpsrA and HT66ΔrpeA) as well as the double mutant (HT66ΔpsrAΔrpeA). We speculated a regulating cascade that psrA regulates the phenazines biosynthetic operon by quorum sensing independent regulators rpeA/rpeB in P. chlororaphis HT66. CFC medium (containing cephaloridine, Fucidin, and cetrimide) purchased from the Qingdao Haibo was used to isolate pseudomonads from the soil samples . The pseudomonad isolate and its mutants were cultivated on King’s B medium (KB) at 28 °C using standard methods and preserved in 30% (v/v) glycerol at − 80 °C for long-term maintenance. Escherichia coli DH5α was grown on Luria–Bertani (LB) medium (tryptone 10.0 g, yeast extract 5.0 g, NaCl 10.0, 15 g/L agar if solid medium). If needed, the following antibiotics were added to the medium at following concentrations: tetracycline (Tc, 150 μg/mL) and gentamicin (Gm, 40 μg/mL) for Pseudomonas; spectinomycin (Sp, 100 μg/mL) and Tc (20 μg/mL) for E. coli. The plasmid pK18mobsacB used to harbor homologous fragments with the target a sequence deriving from pK18 is a broad-host-range vector containing genetic loci sacB and Kmr (Accession No. FJ437239) . LB broths supplemented with 15% sucrose were used to counter select the suicide plasmid pEX18Tc. The bacterial strains, plasmids, and primers used in this study are listed in Table 1. The rhizosphere soil of rice was used for pseudomonad isolation. The sampling site was located in Jinhui Town (Shanghai City, China) and the soil core was clayey, pH 7.0–7.8. Rice roots, together with soil, were collected and pretreated following a previously described method . The cores were suspended in phosphate buffer solution (120 mM NaCl and 2.7 mM KCl in 10 mM phosphate buffer, pH 7.6) by vortex mixing and sonication in an ultrasonic cleaner, followed by centrifugation at 3000 rpm. A 5 mL of the resulting supernatant was then inoculated in 100 mL CFC-selective medium in a 250-mL conical flask. The mixture was cultured overnight at 28 °C at an agitation speed of 180 rpm, and 200 μL mixtures were spread onto each CFC-selective agar plate at the proper dilutions (20–200 colonies per Petri dish) after the designated incubation period. The 16S rDNA of strain HT66 was amplified from genomic DNA by a polymerase chain reaction (PCR) using the forward primer 27F (5′-AGAGTTTGATCMTGGCTCAG-3′) and reverse primer 1492R (5′-TACGGHTACCTTGTTACGACTT-3′) . PCR was performed using the initial denaturation at 94 °C for 3 min, 30–35 cycles at 94 °C for 30 s, at annealing temperature 50 °C for 1 min, at 72 °C for 2 min extension, and a final polymerization at 72 °C for 5  min. The PCR-amplified products were sequenced by Beijing Genomics Institute (BGI, China). A phylogenetic tree was constructed based on the dissimilarity index by comparing with validly published 16S rDNA sequences of related type strains from GenBank, using the neighbor-joining method and ClustalX (version 1.83) program to perform multiple alignments. The phylogenetic and molecular evolutionary analyses were carried out using MEGA version 5.0 . After 24 h incubation on KB, 40 mg of bacterial cells from the KB medium were harvested. Saponification, methylation, extraction, and base wash were conducted according to previously described methods to convert the total cellular fatty acids to fatty acid methyl esters (FAME) for gas chromatography (GC) analysis. An Agilent 7890A GC system equipped with a capillary-optimized flame ionization detector (FID) and an ARC Polyarc reactor (PA-RRC-A02) was used for the analysis of FAME using helium (99.999%, Praxair) as the carrier and FID makeup gas. The GC results were automatically compared with Sherlock libraries by a covariance matrix, principal component analysis, and pattern recognition software to identify bacteria based on their distinct fatty acid profiles. An initial culture of strain HT66 was grown in KB liquid medium for 24 h at 28 °C (180 rpm). The culture was transferred to 20-L KB medium in a bioreactor (Sartorius & BIOSTAT C+) at 1.0% inoculation ratio. Cultivated for 3 days, the fermented broth was extracted with equal volume of ethyl acetate three times. Finally, a 10 g crude extract was harvested after the organic phase was evaporated under vacuum pressure at 37 °C. The concentrated crude metabolites were dissolved in methanol, and major compounds were purified by preparative HPLC (Shimadzu LC8A). The molecular structures of the active fractions were elucidated by mass spectrum, 1H, and 13C nuclear magnetic resonance (NMR) spectrometer. Ultra-performance liquid and quadrupole time-of-flight mass spectrometry (UMS) was performed on ACQUITY™ UPLC & Q-TOF MS Premier (Waters, USA). The instrument was equipped with electrospray ionization to separate peaks that cannot be resolved by LC alone and time of flight mass spectrometers in mass detection. 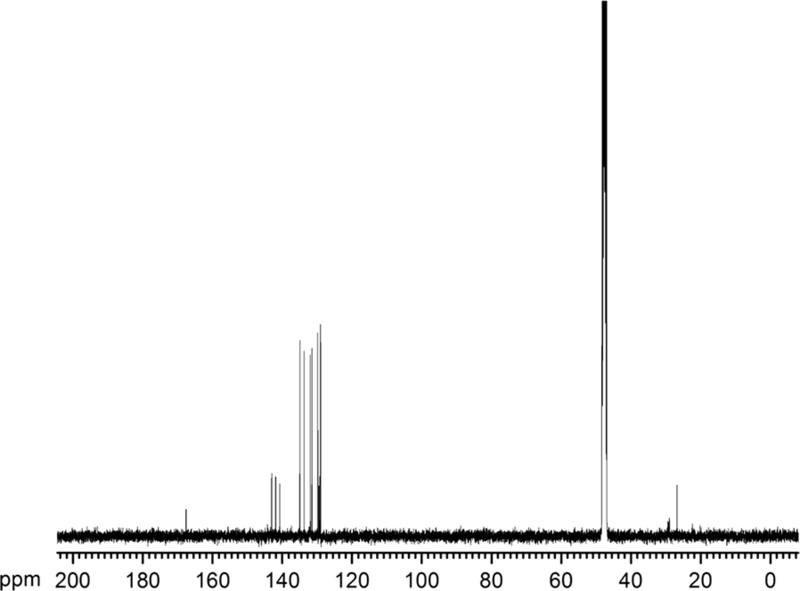 1H and 13C NMR spectra were acquired on a Bruker model Avance III 400 MHz (BRUKER, Switzerland) spectrometer at 400 MHz for 1H and 100 MHz for 13C in MeOD as a solvent. Gene deletions in P. chlororaphis HT66 strain were conducted using a markerless deletion method with pK18mobsacB as described earlier . The primers psrA1 and psrA2 were designed to amplify the gene psrA from strain HT66 at the annealing temperature 47.4 °C, whereas primers pBS-Kan-R and pBS-Kan-F were used to amplify the Kan resistance gene KanR in plasmid pBS(Kan) at 50 °C. The purified PCR-amplified products of psrA were cloned into the suicide plasmid pEX18Tc and inserted by the fragment containing KanR at a filled SphI site. The resulting plasmid pEX18Tc containing 2.5 kb HindIII–SacI fragment was then mobilized from E. coli SM10 to strain HT66 by biparental mating. Putative transconjugants were screened on LB plates supplemented with 15% sucrose, Sp, and Kan. After the second crossing over, Kan-resistant, Tc-sensitive, and sucrose-resistant recombinants were recovered. Sequencing analysis revealed that the psrA gene open reading frame was inserted by Kan resistant gene approximately 491 bp downstream of the start codon. The resultant chromosomally inactivated psrA mutant was designated as HT66ΔpsrA. The construction of rpeA inactive and psrA/rpeA double inactive mutants was carried out using the same methodology described previously for the psrA mutant. A total of 0.5 mL of fermented broth was firstly adjusted to pH 2.0 using 6 M HCl and extracted with 3 mL of ethyl acetate by vigorous shaking. After centrifugation, the organic phase (0.2 mL) containing phenazine compounds were evaporated under vacuum pressure. The resulting residue was dissolved in methanol, filtered through an organic phase filter (0.22 μm), and subjected to HPLC (Model 1260 infinity, Agilent Technologies, Santa Clara, USA) using a WondaSil C18-WR reversed-phase column (5 μm; 4.6 × 250 mm, Shimadzu, Japan) at 254 nm. The mobile phase changed during the detection process i.e. methanol: ammonium acetate = 20:80 (v/v) in the first 5 min, then changing to 50:50 in 5–25 min and 20:80 again in the last 5 min (25–30 min). The flow rate was 1.0 mL/min, and the column temperature was maintained to 30 °C. The retention times for PCA and PCN were approximately 9.523 and 17.217 min, respectively (Additional file 1: Fig. S1). After incubation for 72 h, HT66 cells were immediately harvested by centrifugation (at 12,000  rpm for 2 min at 4 °C), and the total RNA was extracted using RNAprep Pure Cell/Bacteria Kit (TIANGEN, China). Genomic DNA was eliminated using DNase. cDNA was synthesized using random primers at 37 °C for 1 h with Quantscript RT Kit (TIANGEN, China). The qRT-PCR was performed in 20 μL volume with aliquots (1 μL) of cDNA or water (no-template control), primers (200 nM final concentration), and 10 μL of SuperReal PreMix Plus (SYBR green I, TIANGEN, China) in an Eppendorf RT-PCR system. Primers were designed to amplify 148–152  bp fragments (Additional file 1: Table S1). The qPCR amplifications were carried out at 95 °C for 10 min, followed by 40 cycles of 95 °C for 15 s, 45 °C for 30 s, and 68 °C for 15 s, and a final dissociation curve analysis step from 68 to 95 °C. Amplification specificity for each reaction was verified by melting-curve analysis according to the Eppendorf RT-PCR system software. Threshold cycle (Ct) values were used to calculate relative fold changes in expression of each gene by the ΔΔCt analysis . The rpoD gene served as a reference gene to normalize each gene expression . The primer pairs used to detect the gene expression of gacA, gacS, psrA, rpoS, pip, rpeA, rpeB, phzR, phzI, and phzE in strain HT66 wild-type, HT66ΔpsrA, HT66ΔrpeA, and HT66ΔrpeAΔpsrA are portrayed in Additional file 1: Table S1. Nucleotide sequences of the 16S rDNA/phzH/rpeA and psrA gene of P. chlororaphis HT66 were deposited in GenBank. The Accession Numbers are KF857481/KF900067/KF900068 and KF900069. The strain HT66 exhibited notable antifungal abilities against Rhizoctonia solani and Pythium ultimum, the pathogen of Stevia leaf spot disease, and Fusarium oxysporum f. sp. niveum (Additional file 1: Fig. S2). The colony of strain HT66 on KB plate was circular and moist with light yellow coloration after incubation of 24 h and with a dark green pigment on the colony surface at 72 h or longer. The phylogenetic tree is one of the major criteria of microbial taxonomy. A 1407 bp nucleotide sequence of the 16S rDNA gene was amplified from strain HT66 by universal primers 27F/1492R. 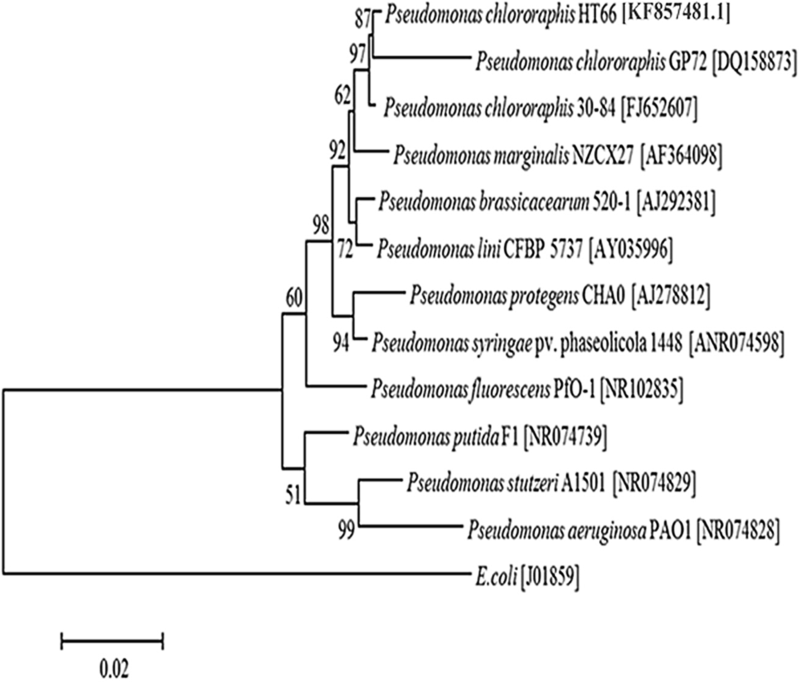 The phylogenetic tree based on 16S rDNA indicates that strain HT66 is close to P. chlororaphis with 99% similarity (Fig. 1). The report of fatty acid methyl ester analysis by Sherlock MIS database showed that the strain HT66 was at the highest Sim index to P. chlororaphis (Additional file 1: Fig. S3, Table S2). Based on above experiments, we concluded that strain HT66 belongs to P. chlororaphis species (Strain HT66 was preserved in China Center for Type Culture Collection at Wuhan, China. Accession No. is CCTCC M 2013467). 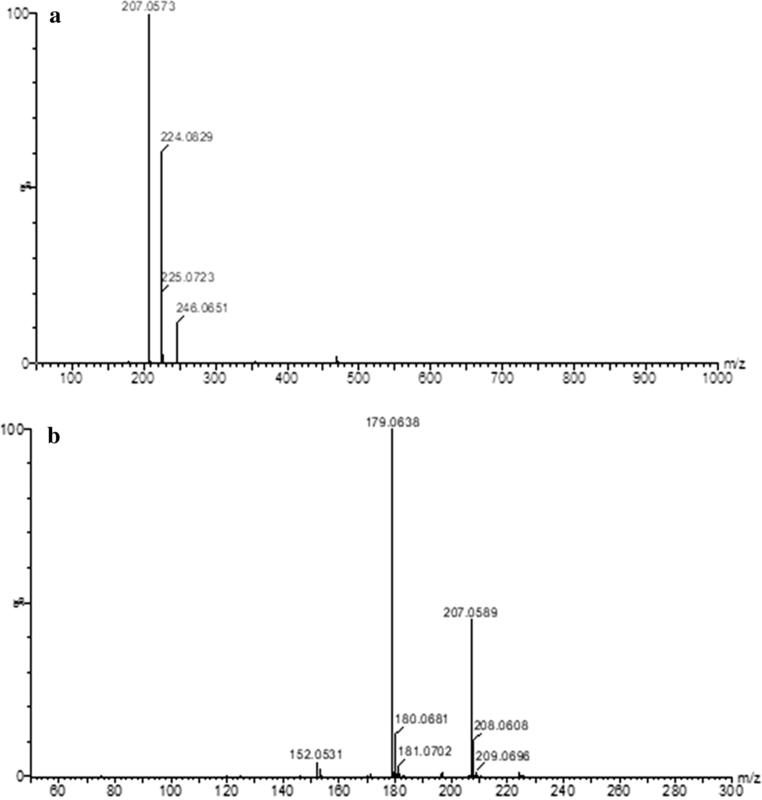 From mass spectrum at the low cone voltage, the molecular mass of the antifungal compound on UMS was 224.08 as m/z 225.07 corresponding to the protonated [M + H]+, m/z 246.06 corresponding to the sodiated [M + Na]+, and m/z 207.06 corresponding to the loss of NH3, as shown in Fig. 2. In the high cone voltage spectrum, a very intense fragment ion was observed at m/z 179.06, corresponding to the eliminated carboxamide functional group and protonated phenazine ring. 1H NMR spectrum displayed signals corresponding to protons in the vicinity of heteroatoms, which are very useful to disclose chemical structure (Fig. 3). The 1H NMR spectrum chemical shifts of the purified compound of P. chlororaphis HT66 were as follows: 1H NMR (MeOD, 400 MHz, ppm), H-2 (d 8.46, dd), H-3 (d 8.07, dd), H-4 (d 8.86, dd), H-6 (d 8.38, ddd), H-7 (d 8.00, ddd), H-8 (d 8.02, ddd), and H-9 (d 8.29, ddd). 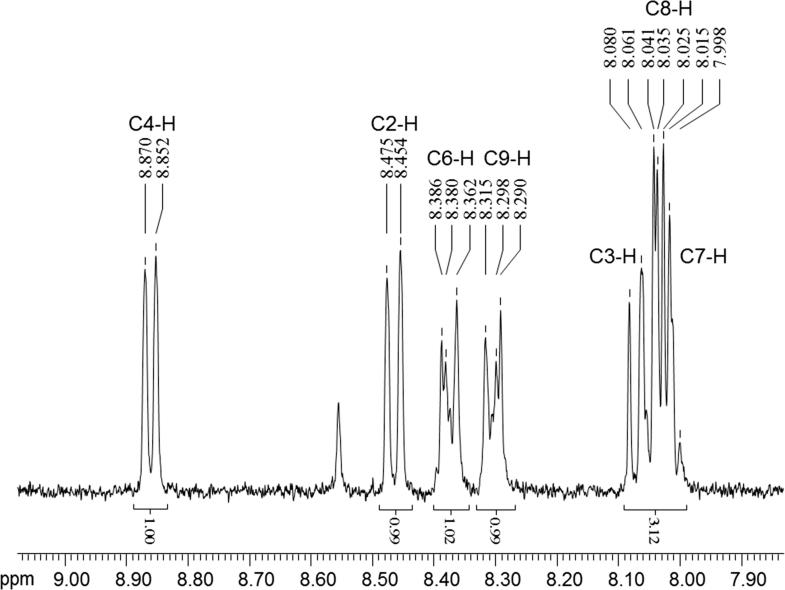 The 13C NMR spectrum of the purified antifungal compound exhibited the appearance of a carbonyl carbon of the amide group at d 167.53 (Fig. 4). The residual aromatic carbons showed signals between d 128.93 and 143.06. Based on the combination of UMS and NMR data, the purified compound isolated from P. chlororaphis HT66 was definitively identified as a PCN. In this study, strain HT66ΔpsrA, HT66ΔrpeA, and HT66ΔpsrAΔrpeA were constructed and subjected to fermentation. Time-course fermentation pro-file of PCN production and cell growth are portrayed in Fig. 5. Experimental results showed that the production of PCN substantially increased in all the mutant strains (Fig. 5a). After fermentation of 24 h, the production of PCN in the wild-type HT66 was 424.87 mg/L and increased to 703.93 mg/L in strain HT66ΔpsrA, a 1.66-fold increase, representing the repressive effect of psrA on phenazines biosynthesis in strain HT66. Similarly, compared with wild-type HT66, the production of PCN increased 3.06-fold in strain HT66ΔrpeA, which was as high as 1300.69 mg/L. Moreover, the PCN yield increased to 1800.54 mg/L (4.24-fold increase) in double mutant strain HT66ΔpsrAΔrpeA in comparison with the wild-type HT66. The results demonstrated that both psrA and rpeA play an important role in the regulation and biosynthesis of phenazines in strain HT66. The cell density of HT66ΔpsrA and HT66ΔrpeA strains was modestly decreased, whereas a marked decline in cell density was observed in case of HT66ΔpsrAΔrpeA in comparison with the wild-type HT66 strain (Fig. 5b). As described earlier, a series of regulatory genes are involved in phenazines metabolism cascade. qRT-PCR experiments were carried out to measure the expression of related genes to elucidate the action of psrA and rpeA for phenazines regulatory network in P. chlororaphis HT66 strains. 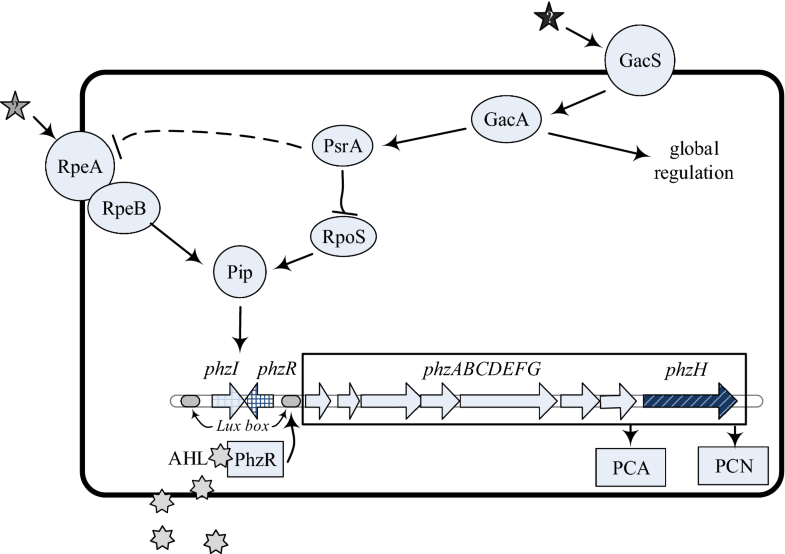 The target genes are homologous of known PCA/PCN regulating genes and have direct or indirect interaction with psrA/rpeA in other bacterial species. Table 2 illustrates the relative fold changes in expression of all the tested genes. Though the phzR expression difference in wild-type and the psrA/rpeA mutant was not significant, phzI expression was markedly high, especially in the double mutant. Consistent with phenazine production, phzE expression was increased 3.33-fold compared to the wild type in HT66ΔpsrA, 4.15-fold in HT66ΔrpeA, and 16.53-fold in HT66ΔpsrAΔrpeA. On the contrary, the expression of phzI, phzR, and phzE was amplified much more in HT66ΔpsrAΔrpeA than in HT66ΔpsrA and HT66ΔrpeA which indicated that knockout of psrA and rpeA can improve the productivity of PCN. We also scrutinized the expression of several phenazine regulatory genes, including rpoS, gacA/gacS, and pip, which are known to possess key roles in the biosynthesis of phenazine. Notably, loss of psrA resulted in a significantly (P < 0.05) increased expression of rpeA and rpeB, whereas rpoS and pip expression levels were slightly enhanced. Similarly, the rpeA inactivation considerably increased (P < 0.05) the transcription of rpeB and pip but did not affect the transcription of rpoS. The results were consistent with those in rpeA/rpeB and rpoS where the system independently regulates phenazine via pip in strain 30–84.31 In conclusion, qRT-PCR analyses revealed that the inactivation of psrA led to a significantly increased expression of rpeA, while inactivation of rpeA resulted in decreased psrA expression levels. Considering the culture characteristics, phylogenetic analysis of 16S rDNA, and gas chromatography of cellular fatty acids, strain HT66 was identified as P. chlororaphis. The P. chlororaphis plays an important role in the biological control of plant disease caused by phytopathogens by producing a unique set of secondary metabolites such as PCA, PCN, 2-hydroxy-PCA, and 2-OH-phenazine . Depending on environmental conditions, the number and types of phenazines produced by an individual bacterial strain may also fluctuate. Phenazine derivatives can be synthesized simultaneously or individually in any organism. For example, P. chlororaphis GP72 produces PCA accompanied by a small amount of 2-OH-phenazine, whereas P. chlororaphis PCL1391 produces mainly PCN. Based on the results obtained from UMS and NMR, the active metabolite that mediates the broad-spectrum antifungal phenazine derivatives produced by strain HT66 has been chemically characterized as PCN (Figs. 2, 3, 4). In previous studies, the PCN has been identified in P. chlororaphis PCL1391, P. aeruginosa PAO1 , P. aeruginosa PUPa3 , Pseudomonas sp. PUP6 , and P. aeruginosa MML2212 . The yields of PCN in these strains are too low to be applied for the agricultural purposes. P. chlororaphis HT66 can be used as an effective biological control candidate against fungal pathogens, as the highest production of PCN in wild-type strain was recorded to be 424.87 mg/L. Considering in view that PCN displays more potent antifungal activities than PCA in wider pH ranges, the improvement of PCN production is very meaningful. As described in previous studies, Pseudomonas species utilize conserved regulatory elements for phenazines production including the gacS/gacA, rpeA/rpeB, psrA, pip, rpoS, and the quorum sensing system phzI/phzR. The synthesis of core phenazine PCA is encoded by a conserved series of phzABCDEFG in phenazine-producing bacteria. In P. aeruginosa PAO1, phzM/phzS, phzS, and phzH genes encode typical enzymes involving in the transformation of PCA to pyocyanin (PYO), 1-hydroxy-phenazine (1-OH-PHZ), and PCN . The conversion of PCA to PCN is catalyzed by PhzH, which was homologous with asparagine synthetases belonging to the class II glutamine amidotransferases. The sequence of phzH in strain HT66 is 99% similar to the phzH sequence of strain PCL1391. At the similar HPLC assays, little PCA and relatively large amount of PCN can be detected from 12  h fermentation broth. However, after 24 h of fermentation, only PCN can be found from the crude broth, which demonstrated the high efficiency of phzH in P. chlororaphis HT66 (Additional file 1: Figure S1). Investigation of phenazine metabolic pathways provides critically important evidence for future genes manipulation so as to produce more phenazine derivatives for industrial usage. In this context, extensive research efforts have been devoted to understanding the phenazine-regulating mechanism. Herein, we investigated the role of two genes, psrA and rpeA on the phenazines biosynthesis. Both of these genes are sensitive to environmental changes and play a major role in determining phenazine production. To date, only two possible negative regulators of phenazine biosynthesis in P. chlororaphis are reported: rpeA  and psrA . In strain 30–84, rpeA appears to markedly repress PCA biosynthesis in minimal medium. The PCA and 2-OH-PHZ production were considerably increased in rpeA inactivated GP72AN strain . However, no report has been presented about the role of psrA and rpeA on the regulation of PCN biosynthesis. In this study, single mutant strains HT66ΔpsrA and HT66ΔrpeA have been shown to produce about 1.66 and a 3.06-fold increase of PCN compared with the wild-type strain. On the other hand, a 4.24-fold enhancement in PCN production was recorded in double mutant HT66ΔpsrAΔrpeA, indicating that both psrA and rpeA are repressors for PCN biosynthesis in strain HT66. The qRT-PCR results showed a significantly increased level of PCN production in all the mutants (Table 2) that might be attributed to the high transcription levels of phzI, phzR, and other phenazine biosynthetic genes. The transcription level of rpeA and rpeB in strain HT66ΔpsrA increased at 3.52- and 11.58-folds, respectively, indicating that psrA might act on rpeA/rpeB to regulate phenazine biosynthetic operon. The reduced psrA expression in HT66ΔrpeA evidenced a complex regulation mechanism for PCN production in HT66. Previous studies reported that PsrA binds to a PsrA-binding box to regulate rpoS in other Pseudomonas species . The present findings show that psrA contributes to an additional level of regulation in strain HT66 by suppressing phzI/phzR or quorum sensing-regulated genes. One tentative proposal might be that the increased expression of rpeA/rpeB in HT66ΔpsrA is a consequence of psrA regulating not only rpoS but also the rpeA/rpeB system, which influences indirectly the phenazine biosynthetic operon. Support for this interpretation comes from a putative theory which suggests that in P. chlororaphis PCL1391, the production of PCN differs little from wild-type after double mutation of psrA/phzI or psrA/phzR, whereas the PCN production cannot be detected in simply-mutated phzI or phzR. Conversely, high production of phenazine autoinducers not increases the PCN production compared with wild-type in the psrA/phzR double mutation strain PCL1391. All of these facts indicate that psrA might interact with a quorum sensing-independent regulator, which is more likely rpeA, to control PCN production [27, 28]. The little change of rpoS and pip transcription level in strain HT66ΔpsrA may suggest that psrA mainly controls the rpeA/rpeB system to influence the PCN synthase in strain HT66 (Fig. 6). The proposed model displays the relationship between the rpeA/rpeB and psrA in relation to other known regulators. Finally, another important cascade must exist downstream of psrA. Hence, this cascade involves the rpeA/rpeB (dotted lines) can be hypothesized. While the expression level of psrA in HT66ΔrpeA was reduced, taking into account the role of psrA and rpeA mutants are all environmentally dependent, the autoregulation of psrA might be affected by rpeA/rpeB system. The earlier study speculated that rpeA/rpeB can regulate the expression of a second quorum-sensing system except only phzI/phzR to control phenazine biosynthetic operon in P. chlororaphis 30–84. Phenazines production in the phzR/rpeA double mutant strain 30–84 was not different from the wild-type, as consistent with the conclusion that rpeA/rpeB system is regulated by psrA [31, 43]. Future research studies should be focused on the analysis of the interaction between rpeA/rpeB system and psrA. 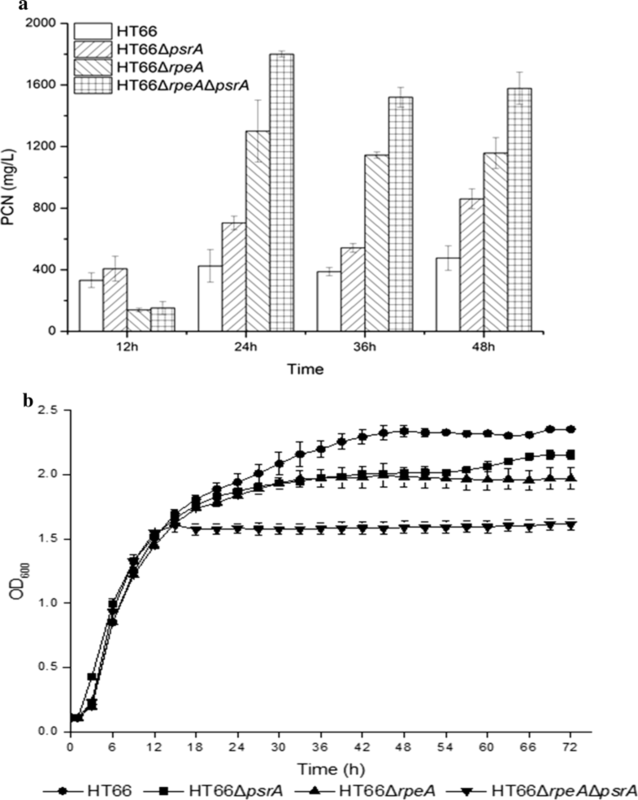 The role of different environmental conditions on the expression of psrA/rpeA and other related phenazine-regulating genes also need to be explained further in P. chlororaphis HT66. In this study, the novel strain HT66 of P. chlororaphis was isolated and identified through 16S rDNA sequence and cellular fatty acid analyses. The antifungal compound produced was purified and identified as PCN through mass spectrometry, and 1H, 13C nuclear magnetic resonance spectrum. Moreover, the newly isolated strain produced a high level of PCN with the fermentation titers of 1800.54 mg/L (4.24-fold increase) in double mutant strain HT66ΔpsrAΔrpeA compared with the wild-type HT66 that only produced 420.0 mg/L. In conclusion, high PCN biosynthesis by engineered P. chlororaphis HT66 demonstrates its great biotechnological perspective to hyperproduce not only PCN but also other valuable bio-pesticides for agricultural applications. PZ carried out the experimental work and drafted the manuscript. WW, HH, and XHZ analyzed and interpreted the data, and provided suggestions about overall research plan. MB edited and reviewed the whole manuscript. All the research work was carried out under the guidance and supervision of PZ who designed, conceived and coordinated the experiments. All authors read and approved the final manuscript. This work was supported by the National Key Basic Research Program of China (No. 2012CB721005), the National Natural Science Foundation of China (No. 31270084), and the National High Technology Research and Development Program of China (No. 2012AA022107). 12934_2018_962_MOESM1_ESM.docx Additional file 1. Additional figures and tables.